Thousands celebrate as life insurance leader announces recipients of holidays to Paris, Beijing and Singapore and a mass excursion to Leisure World. Two families from Ambalantota, Sri Lanka's Deep South were among five families that won an all-expenses paid holiday in Paris when Ceylinco Life conducted the final draw for 'Family Savari 6' , the company's annual mega promotion for policyholders. 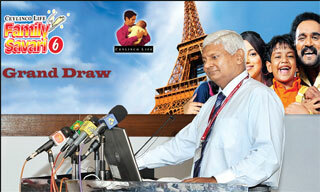 Ceylinco Life’s Managing Director and CEO R. Renganathan draws winners for the Paris tour. A total of 450 families received news of their good fortune this week, as winners of holidays in Paris, Beijing and Singapore, as well as a day's outing at the Leisure World theme park by the life insurance leader. Another 460 others whose names were drawn in October last year at the first draw of the Family Savari 6 programme, taking the total number of winners in this edition of the programme to 2,260. As in previous years, all 'Family Savari' winners were selected using Ceylinco Life's sophisticated software that generates random numbers from a database within a few seconds. The overseas tours and the local excursion is scheduled to take place in March, April and May 2013. Speaking at the final draw, Ceylinco Life's Managing Director and CEO R. Renganathan said a total of 13,760 people belonging to the families of 3,440 policyholders had to date benefitted under the company's Family Savari series of promotions, easily the most generous and logistically challenging rewards scheme in the country's insurance sector. "The Family Savari programme continues to break new ground with the addition of an exciting new destination or activity each year," Renganathan said. "We have already begun discussing possible destinations for 2014, and our policyholders are waiting with bated breath to hear the plan." The promotion period for Family Savari 6 ran from August to December 2012, during which all active long term Ceylinco Life policyholders as well as holders of Ceylinco Life Retirement Accounts (CRAs) earned multiple winning chances up to a maximum of 10, for the two draws. Emphasising the value of loyalty, policyholders received one additional winning chance for every year they had been with Ceylinco Life, up to a maximum of ten winning chances for those who had been active policyholders for a decade or more. Independently rated as one of Sri Lanka's most valuable brands, Ceylinco Life celebrated its 25th anniversary on January 14, 2013.